At Viking Overhead we take Garage Doors seriously and pride our self in providing the best quality hand built cedar doors! True cedar garage doors have a beauty that can not be replaced by faux wood for certain applications, Although true cedar garage doors require more maintenance than faux wood, the craftsmanship and natural beauty is hard to replace! There are several options when it comes to cedar doors. Every cedar board that is used for building garage doors come with one side being smoothly sanded and the other side of the board rough and splintery. For a more rustic appearance the common choice by homeowners seems to be “rough side out” and “smooth side in” however these can easily be reversed for a more modern and sleek design by placing the smooth sanded side out. Each piece of wood used for building cedar garage doors is kiln dried and hand selected to give a superior appearance as well as prevent warping. There are two common types of cedar chosen by homeowners when designing a new cedar garage door to be built. Most customers choose “tight knot” western red cedar garage doors, while other like “clear cedar”. Clear cedar is basically the same type of wood that goes through the same kiln dried process as the tight knot, however clear cedar basically means that the wood is “clear” of any knots and is usually harvesting from the heart (center) of the tree. Clear cedar garage doors cost more than tight knot because there are only select boards to choose from that have no knots in the wood. Using boards from the heart of the tree usually give the door a naturally dark purple tint to the boards like shown in the picture provided. Between the hundreds of build styles of cedar doors, along with the different finishes, as well as the type of wood, the options are endless! Staining the cedar garage doors yourself are an option as well as having the builders stain them in the wood shop. Our cedar garage door builders can customize your wood garage door in any way imaginable! Whether its hand build window frames with obscure glass, or arched tops and curved designs, Viking Overhead will build your doors exactly the way you want it! 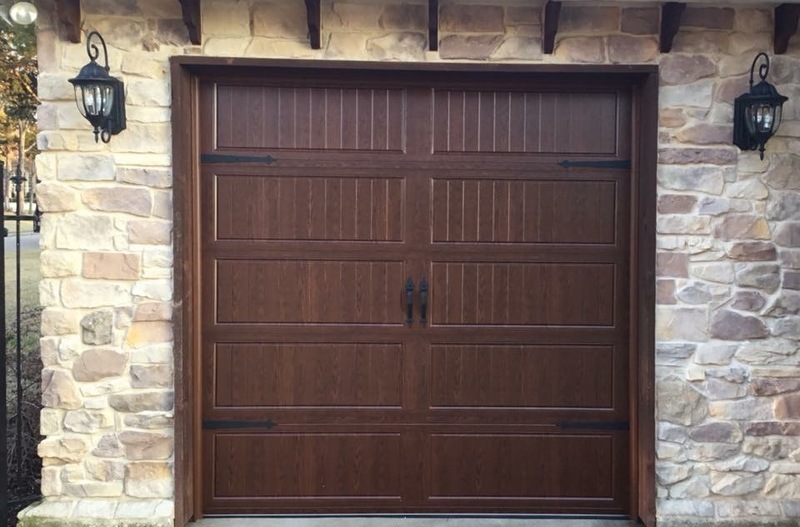 Wood grain garage doors are becoming more and more popular! Many customers prefer the wood look of garage doors but don’t want the maintenance that come with them, this is when Wood Grain Garage Doors make an excellent choice. 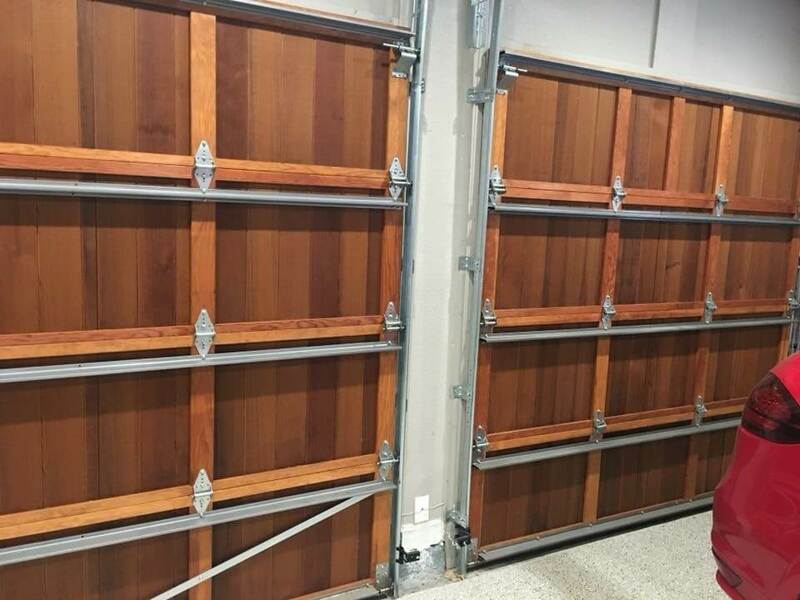 There are 2 main types of Faux Wood Garage Doors, the first is a steel garage door with a wood grain print and paint that covers the door (see picture) and gives it the appearance of a true wood garage door. These prints and paints have come a long ways over the past 15 years and are not only offered with excellent warranties, but are also becoming more and more detailed and realistic looking. Many Brands offer a very realistic Faux Wood Print. Doorlink, CHI, and Clopay are some of our favorites depending on what style your looking for. The Second style of Faux Wood Garage Door are the doors made with composite overlays. Basically they are a flush or flat steel door with composite boards adhered to the exterior of the door giving it the same dimension that would be found on a traditional cedar or wood garage door. Clopay makes some of the nicest composite overlay doors in their “Canyon Ridge” line. Although they are most expensive than a traditional cedar door they are also an overall better quality door in terms of maintenance, R-Value, Structural Strength, and Durability. Viking Overhead carries literature and knowledge to answer any questions you may have regarding Faux Wood Garage Doors! 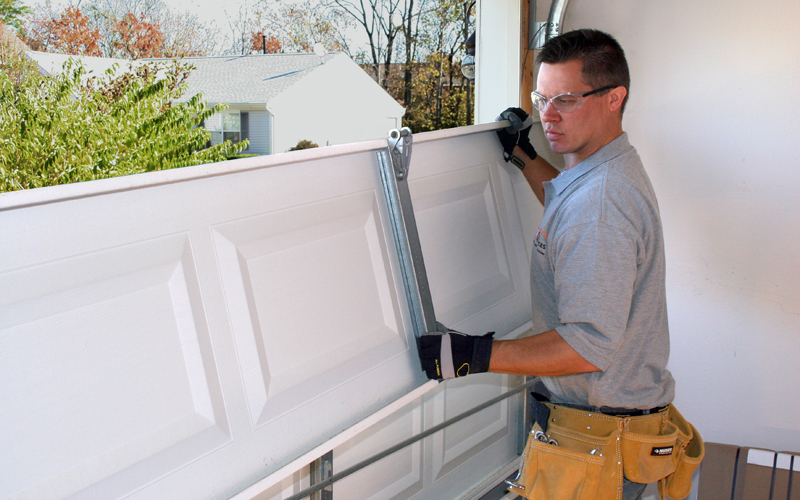 Modern and contemporary style garage doors are becoming more and more popular. 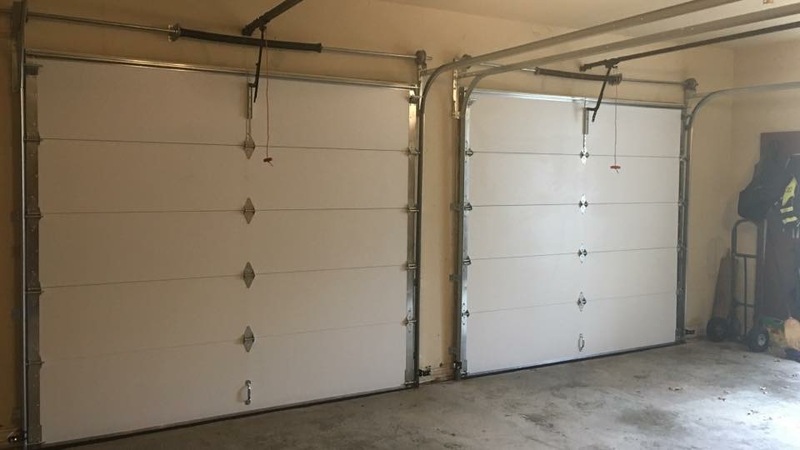 The Modern style garage doors are constructed the same as your standard “sandwich or double steel” doors. The difference is in the appearance. These doors carry the most options and are almost impossible to quote over the phone unless the customer has already done research and knows exactly what they are wanting. This is another reason Viking Overhead offers free onsite estimates so we can show the customer color samples, brochures, and discuss exactly what the customer is looking for so we can provide a detailed and accurate quote. These doors can come in different textures like wood grain or stucco for example, and also can appear to be a flat or flush door or also have horizontal grooves stamped into the garage door panels. The window options are endless with frosted, obscured, acrylic, and Low E being just a few. Feel free to give us a call and schedule an onsite estimate for your modern and contemporary garage doors at (817) 600-4224. If you are wanting to do some research on these doors we highly recommend looking at Clopays “modern steel” line.